Within BIS, we’ve been running a ‘senior Digital Advocate’ programme for almost 2 years. This initiative was originally introduced as one way of helping staff who felt (often wrongly), that senior staff weren’t supportive of online activity and engagement. We wanted to challenge that perception. Fittingly, the programme received the endorsement of one of our executive committees – so even more signs of visible senior support. They’re from all areas of the department, from both corporate and policy roles. Those policies are as diverse as science and innovation, small businesses, employment law, and further and higher education. We began the process with an interview with each new advocate to assess their existing digital skill level. The original recruits all had a detailed plan setting out ideas for them to get started on platforms such as Twitter and LinkedIn, and also ideas for them to inspire their teams. We backed these up by quarterly reviews, and, as needed, face to face training and support. Everyone embraced their role with gusto. We have seen some great digital activity emerging from their teams as a result, from encouragement of digital objective setting, regular listening and greater appreciation of online insight, live chats, to blogs, and beyond. Others have really empowered their resident Digital Buddies. As a result, we’ve seen concerted activity to get people listening to businesses online, for example, and even a directorate wide embedding plan being developed. We’ve definitely seen the advocates’ own relationship with digital activity changing, with many admitting that they now see digital as business as usual, part of everyday life and not an add on. All of this is great, and backs up the insights from evaluation of our other digital embedding activity streams. Developing, and monitoring progress on, plans for each advocate was much easier with our initial cohort of 10 advocates. It became a little bit more difficult to support when we doubled our numbers. At that point, we offered each advocate the chance to undertake the tailored Digital Action Plan offered by Helpful Technology. You can read more about how a range of senior civil servants approached this experience on this blog from one of the Helpful Team. We wanted to continue supporting our advocates, and proving regular inspirational nudges, so we now provide a weekly email highlighting interesting digital news from both the public and private sectors. We started off by looking at digital engagement, but also share news and titbits on digital transformation and digital leadership. We also use a dedicated Pinterest board to share those interesting articles and insights (and sneakily introduce a new tool into the mix). 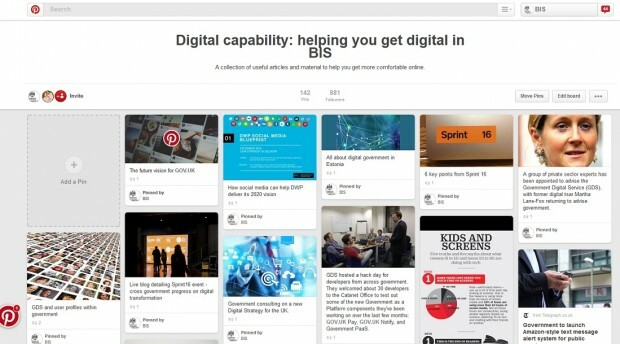 The digital capability Pinterest board was designed to help advocates get digital. As our advocates are at such senior levels, they often don't have a lot of free time. So, feedback from individual advocates indicated that they would like more of a nudge so that they know when they can be supporting BIS (or partner) announcements. We previously used IFTTT to target specific tweets at the advocates, and we’ve also just started a group DM so that we can highlight tweets that the advocates might be well-placed to share with their own growing band of followers. Time will tell if that ups their engagement even more. Setting up a programme like this requires time and dedicated resource, and inevitably staff churn means that we’ve lost a few advocates to either new work areas or completely new departments. Hopefully, they will take their digital enthusiasm with them (we know that they have). Each of the advocates has taken their own digital journey, with some preferring to act as internal cheerleaders for their teams, as opposed to developing their own profiles. That’s fine, and has resulted in some interesting projects (including online engagement to help strategy development or inform policy design, online consultations and reviews, and dedicated online listening). The cheerleading element has also really freed teams and individuals to actively engage with stakeholders online – increasing numbers of staff across the department are doing so. Advocates have undoubtedly had an impact across the department as it’s now not uncommon to hear conversations about gathering online insight in lifts and informal spaces across the department. Have you run a similar programme in your organisation, and have you used any tools to nudge your advocates or champions? What's worked best for you?